Kelly's Konfections: Cupcakes for the Queen's Jubilee! 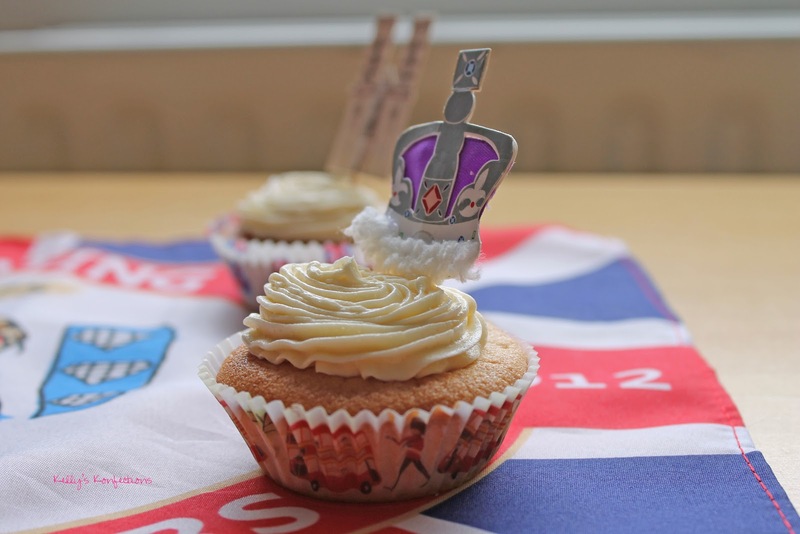 Cupcakes for the Queen's Jubilee! We got a four-day weekend in honor of Her Majesty the Queen's Diamond Jubilee! Yesterday some of my friends and I went to see the Flotilla on the Thames, which was freezing and raining, but still really fun. We might go to the Trooping of the Colour tomorrow, which would require us to get up at 5 am to get good spots... I'm gonna need long underwear for this. 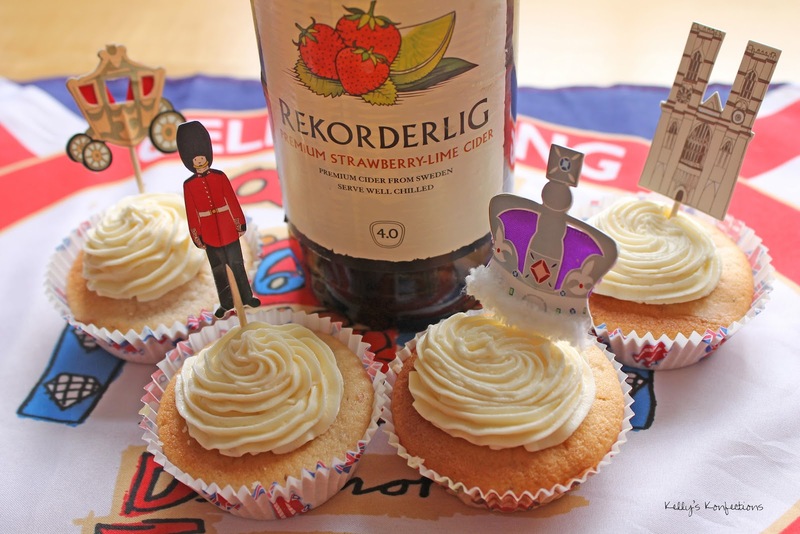 In honor of the Queen's 60 years on the throne (and our four-day weekend), I made Strawberry-Lime Cider Cupcakes. I tried this cider our first week here at a pub with the group at the recommendation of another student, and it was delicious. I decided I had to make a cupcake out of it! 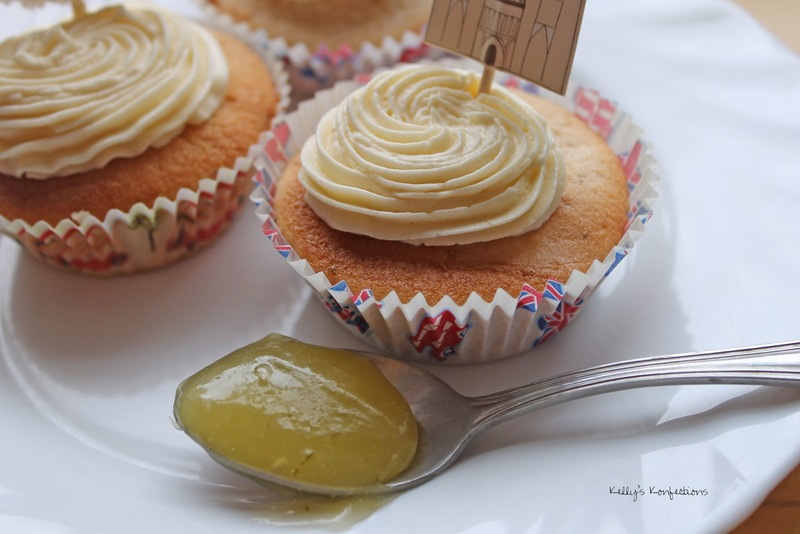 I used my favourite Strawberry Cupcake recipe, buttercream frosting with some cider, and lime curd, my first time making any kind of curd! 1. Puree the strawberries using a food processor. Pour into a bowl, then add milk and strawberry-lime cider. Set aside. 3. In a large bowl (stand mixer is best), beat butter and sugar until light and fluffy. Add eggs one at a time until incorporated. 5. Fill cupcake liners about 3/4 full (they don't rise very much). 6. Bake at 350 for 20-25 minutes, or until the tester comes out clean. 1. Combine sugar, butter, lime juice and lime zest in the top of a double boiler over medium-high heat. Stir until butter melts. 2. Whisk eggs in a small bowl. Spoon 2 tbsp of the heated sugar mixture into the small bowl and stir to combine. Pour egg mixture into top of double boiler. 3. Turn heat down to medium and stir frequently for 10-15 minutes until mixture thickens and coats the back of a wooden spoon. Pour curd into a clean glass jar, cover and refrigerate. 1. Cream butter in the bowl of a stand mixer. 2. Add powdered sugar 1 c at a time, beating until combined. 3. Add strawberry-lime cider and salt, and beat until combined. 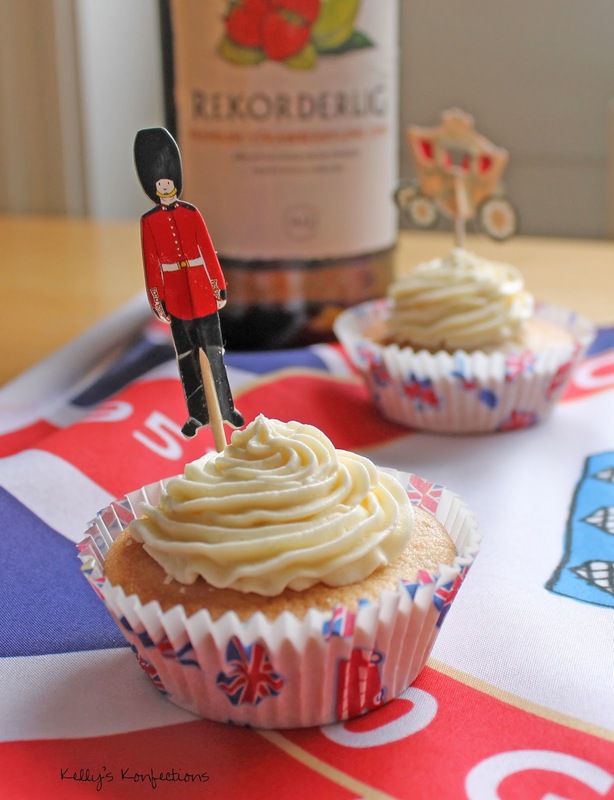 Use a cupcake corer (or a knife, if you're abroad and forgot yours...) to cut out the center of the cupcakes, reserve the tops! Spoon in the lime curd, then pipe on the frosting. It's NOM TIME! In a semi-related note, I just realized I've started spelling things in British.. like "colour" and "favourite." Uh oh. Enjoy the cupcakes and have a great week!